Curlers are hoping to stage an outdoor Grand Match for the first time in more than 30 years. 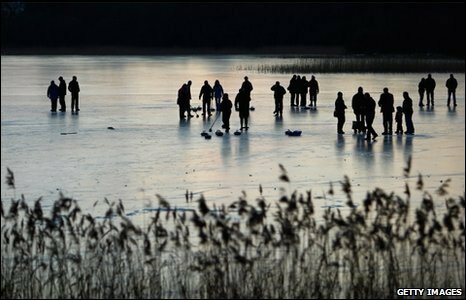 They have begun to mark out rinks on the Lake of Menteith near Aberfoyle, which has not frozen sufficiently for curling since 2001. The Grand Match is a curling tournament held between clubs in the north and south of Scotland. A Royal Caledonian Curling Club committee will meet later to decide whether to hold the event. The last such match also took place on the Lake of Menteith in 1979. The one before that was in 1963. The Grand Match committee is meeting in Kinross to decide whether to stage the competition. The committee's convenor Jim Paterson said the ice needed to be a minimum depth before a match could be held. "At the moment the ice is between five and six inches - we would not call it on until there is at least seven inches of ice and still showing signs of frost," he said. Two thousand curlers from across Scotland take part in a Grand Match, which Mr Paterson described as a "tremendous" spectacle. "The last one was in 1979. It was a perfectly sunny day on perfect ice," he said. "Anyone who has been to one will remember it for the rest of their lives. The sound of the rocks is unreal." Peter MacDonald, a manager at the Lake Hotel in the Port of Menteith, said it would be a "once in a generation" event. "I believe when it happens it really is a big event and everyone that curls in Scotland will come out," he said. Mr MacDonald said about 12,000 people went to the 1979 Grand Match. "Because the ice is so thick and there isn't any snow on the lake, it's perfect," he said. The Lake of Menteith freezes quicker than many other lochs because it is not particularly deep. Temperatures across most parts of Scotland have been below freezing for more than two weeks. Lochleven and Piper Dam are two other venues that have been considered for the Grand Match this winter, but there is currently too much rough snow on the ice in both locations.